Thought it would be fun to get a thread going of our favorite bayonets and tell us why you like them as much. Imperial - M4, in unissued condition, blade is factory razor sharp. 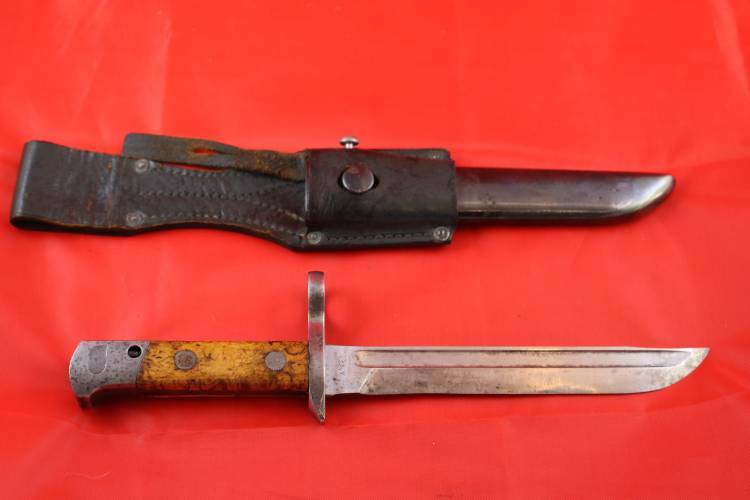 Italian - M-38 folding bayonet. I know they weren't practical, but they're just cool. Finnish Hackman M/42 with Scabbard and AV3 Sky 37 marked Frog. My favorite is the M38 Folding bayonet as well. there are a lot of great bayonets out there, thanks for sharing them with the rest of us. I have bayos for each of my rifles, and, in some cases, have more than one. So I had to limit which ones might be my favorites to four. The 1891 Argentine probably is my favorite because it was the first bayonet I bought--got it with my paper route money when I was about 11 or so. The Garand bayonet is neat because I found the scabbard in a burn pile when I was about six, then about thirty years later I was able to snag the bayo for cheap because it did not have a scabbard. Now, the k98 butcher's blade bayo probably needs no explanation, but, man. When you hook it on to the rifle, that's a formidable thing there. Finally, a strange thing, a bayonet for my 1917 Budapest Mannlicher carbine in the original 8x50r. The blade goes up. I like this one because the Budapest carbine was my first milsurp. This thread is a neat idea. I might put a few more here if I get the gumption. Last edited by CDFingers on Sat Jul 01, 2017 4:38 pm, edited 1 time in total. I will be listing mine soon as I can find time to take pics. I would love to see your pics CDFingers but photobucket does not work for me any more. These sum my interests up well. g98 with model 1898 bayonet! In order to understand your bayonets better can you tell me the year of the M1 and make , you can not just put a pic out of a M1 with out info LOL. How long is the blade on the second one , wow thats quite a set up. Thanks for sharing. On my computer they posted with info. I guess on mobile they don't show up. 16" m1905 model made in 1942.
sparkfly88 wrote: On my computer they posted with info. I guess on mobile they don't show up. To be 100% accurate it is a 28/30 with 35 blade upgrade. Or commonly referred to as a M/28-30-35. I hear ya. Finn Bayonets I have been trying to get the correct info out there for so long because of all the incorrect info spread by certain individuals and sites. Like the mythical M/27-35 bayonet that they took a M/27 and sharpened the blade, drilled a hole, and blued everything. Only problem with that is how did they make the blade wider and sharpen it at the same time? There is no such thing. Or that the numbers found on certain M/39 bayonets are rack or rifle numbers. They are not. The numbers were added when the best M/39 bayonets left in inventory were selected and numbered to be given as gifts. Approx 1,500 were numbered, but only a couple hundred were gifted. The lower the number the better the condition. The more important the more important the recipient. Finns have a record of all the bayonets that were gifted and to whom. My personal favorite is that some "experts" claim they can tell the difference between a Fiskars M/27 Original Configuration and a Fiskars M/27 that has been upgraded to M/29 configuration. They can not. Only way to tell is to open them up or get them x-rayed. Unless of course certain "experts" have super powers that they can see inside items through an internet picture. Last edited by capt14k on Sat Jul 01, 2017 9:06 am, edited 2 times in total. Yeah, Photobucket just changed its rules, so now I upload from home. You should be able to see it now. But all my other pics are fungoo.